Welcome to the 2014 Bento Bloggers and Friends Halloween Hop. 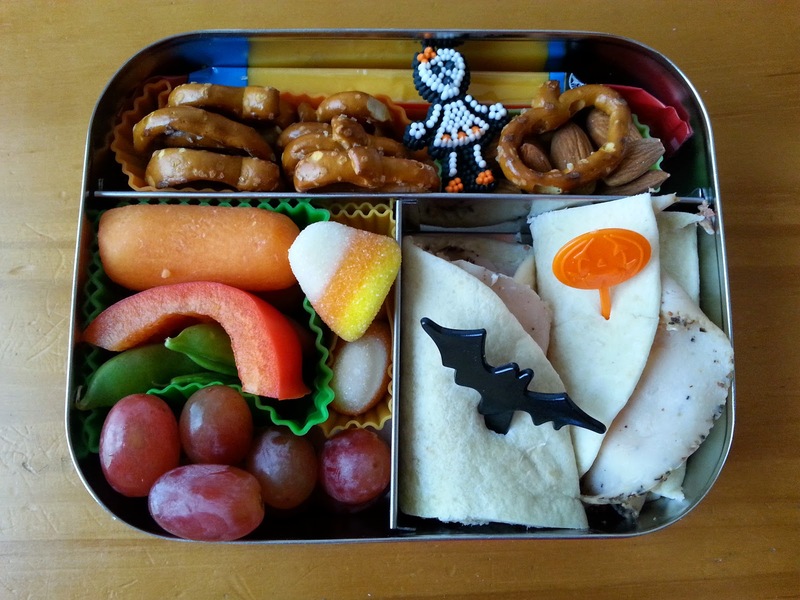 I am happy to be taking time to post some of the lunches I have packed during the month of October and excited to join another Bento Blogger Hop. Since I have literally hundreds of unshared, never blogged lunch photos, I decided to include quite a few in this post. More shared means there are fewer trapped forever on a camera, phone, or in the cloud! Please be sure to scroll all the way to the bottom so your can find the link to the next stop in the Halloween Hop over at Bentos on the Bayou. First up is a lunch I packed for myself. It was packed in a LunchBots Trio. I like packing lunches in this box with a little of this and that. 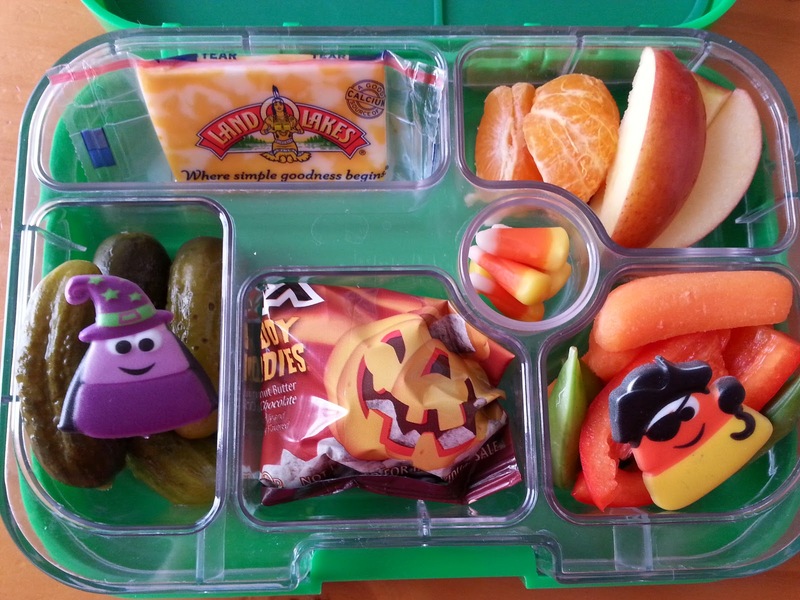 This one included pumpkin shaped pretzels, a cheddar cheese stick, almonds, carrots, red pepper strips, peas, grapes, a couple of candy corn gummy candies, and a turkey wrap cut in half and secured with bat and pumpkin picks. The little skeleton girl at the top is a candy icing decoration. My husband and kids bought those for me for my birthday. 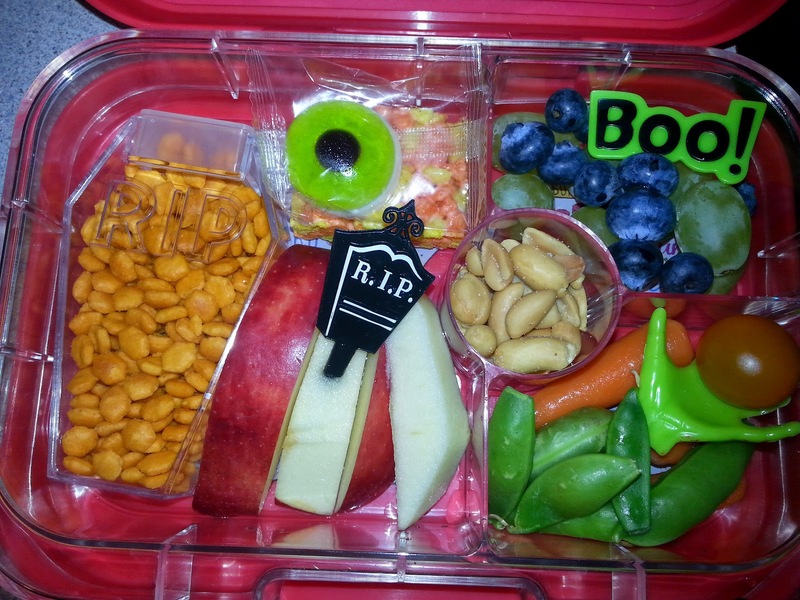 Next are lunches packed for my seven year old (in the green Yumbox) and three year old (in the pink Yumbox). These really are high quality lunch boxes and I have been using these multiple times a week as you will see below. 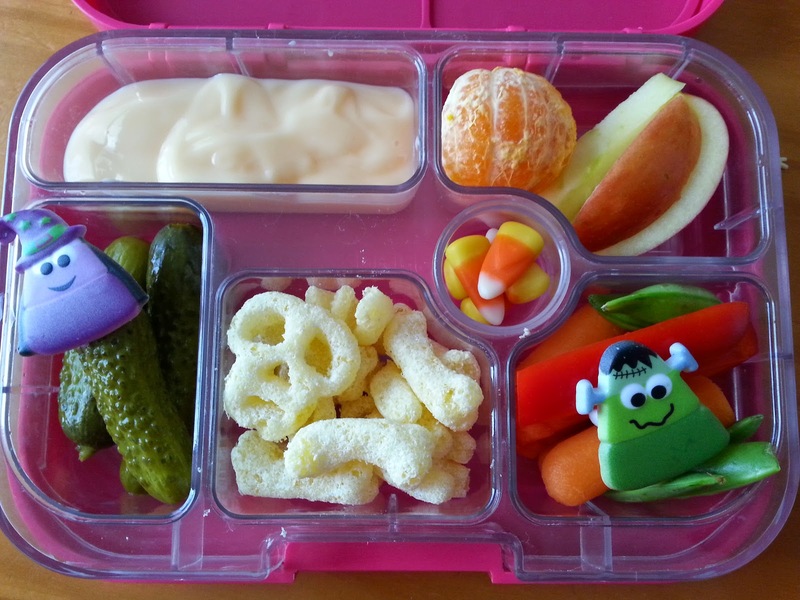 My daughter had a slice of cheese, pieces of an orange, apple slices, pickles, Muddy Buddies, veggies, and a few pieces of candy corn in the center treat section. At a fall festival, my daughter won cupcakes decorated with these candy corn themed rings. She said she picked this set specifically because she knew I would be happy to collect those rings. She is sweet! 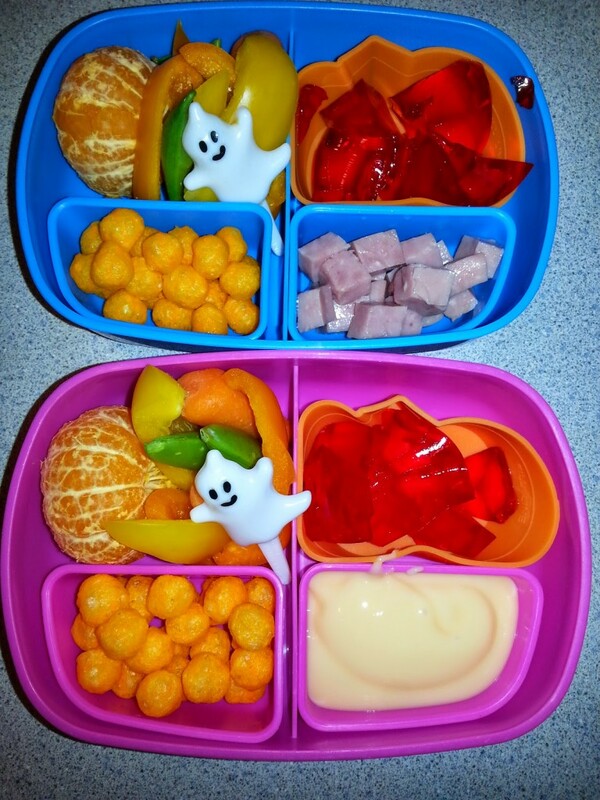 My son had peach yogurt and bone shaped snacks in place of the cheese and Muddy Buddies. The next lunches were packed quickly on a Friday morning in Sassy boxes. My kids had a Cutie, pepper strips, sugar snap peas, carrots, mini cheese balls, and jello in a pumpkin shaped silicone cup. My daughter had cubes of ham and my son had yogurt. 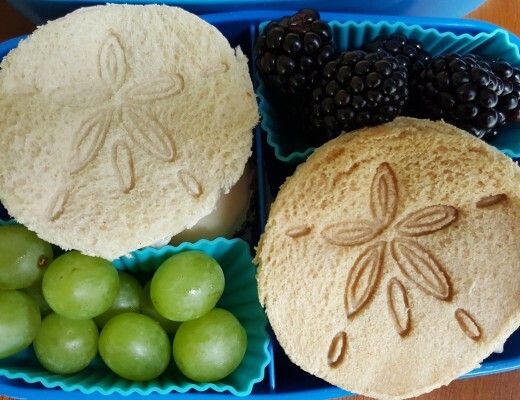 The next lunches for my kids were packed in the new Panino style Yumboxes. My kids had asked to get some of the tiny Cheez-Its in the little bags. Neither one of my children can reliably open packages like that at school, nor do they need to eat a whole pack at a time. So, I had the idea to transfer the little crackers into the clear RIP coffin shaped containers that I had saved. The containers once held sprinkles and had a large enough opening to easily let the crackers in and out. Sticking with the RIP theme, my daughter had a shaped sandwich and RIP gummy. 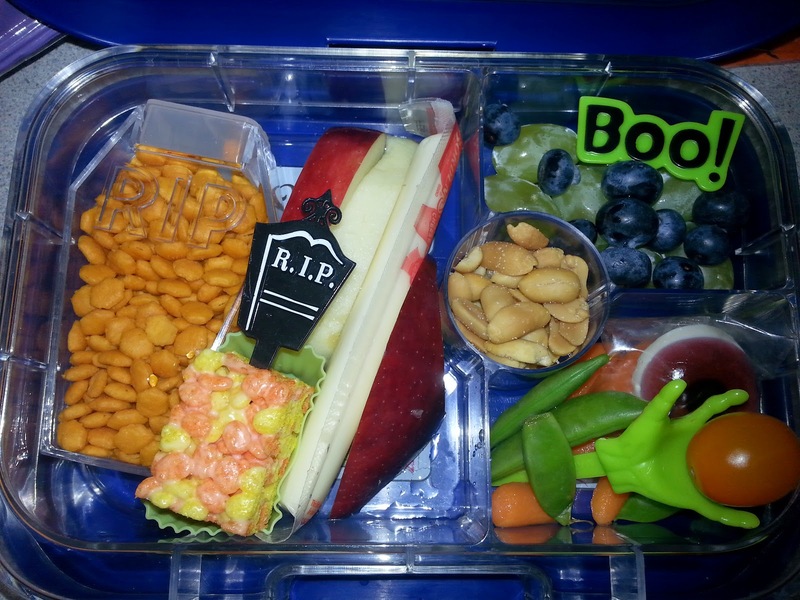 She also had veggies, green grapes with a black cat crawling on top and an orange with a Boo! pick. My son’s lunch was similar with a granola bar in place of the sandwich and blackberries along with his grapes. 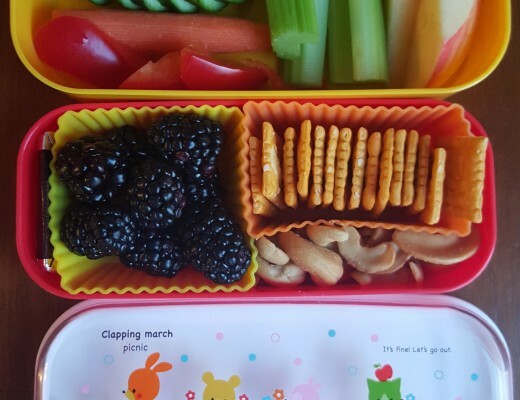 Both kids were happy with the cracker container and my daughter said she had lots of compliments on her lunch. So I reran that idea several days later with slightly different foods and decorations. The second time, my daughter had string cheese, apple slices, a candy corn colored rice cereal treat, peanuts, blueberries, and an eye gummy. My son’s lunch was similar minus the cheese. A nice lady at a local grocery store bakery gave me a couple of candy corn picks so I themed the following lunches using those as inspiration. 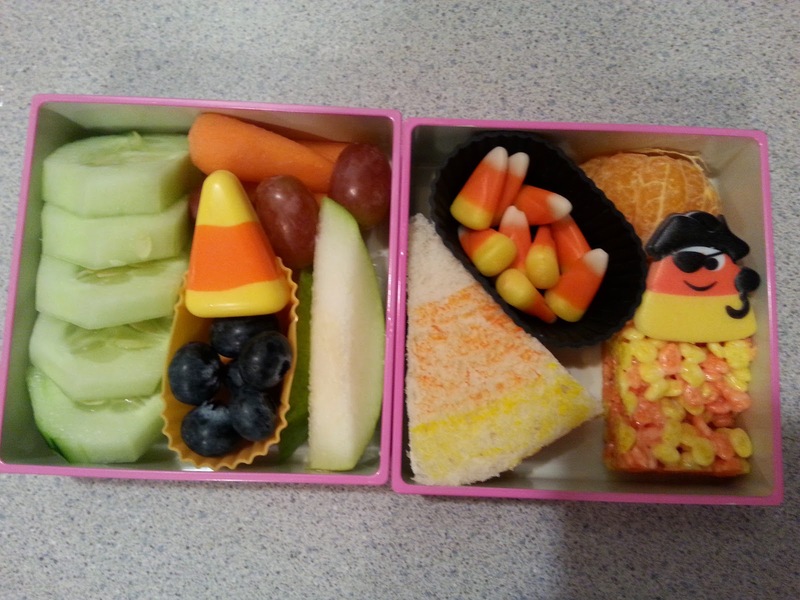 My daughter had cucumber slices, carrots, blueberries, pear slices, and grapes in one layer with a candy corn shaped peanut butter sandwich, candy corn, half a Cutie, and a candy corn colored cereal treat in the other layer. Please excuse the crooked, blurry photo taken at five AM :). 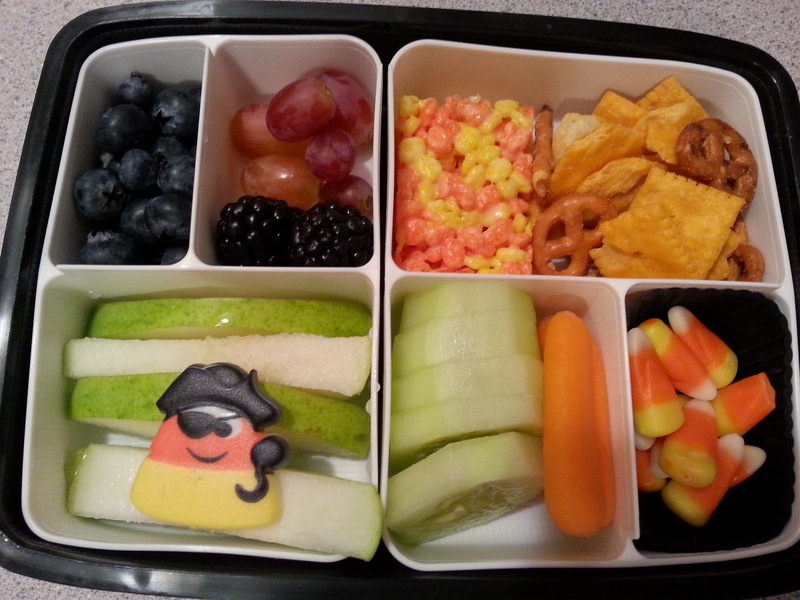 My son’s candy corn themed lunch included blueberries, grapes, blackberries, pear slices with a pirate candy corn ring, cereal treat, Cheez-It mix, cucumber slices, carrots, and candy corn. 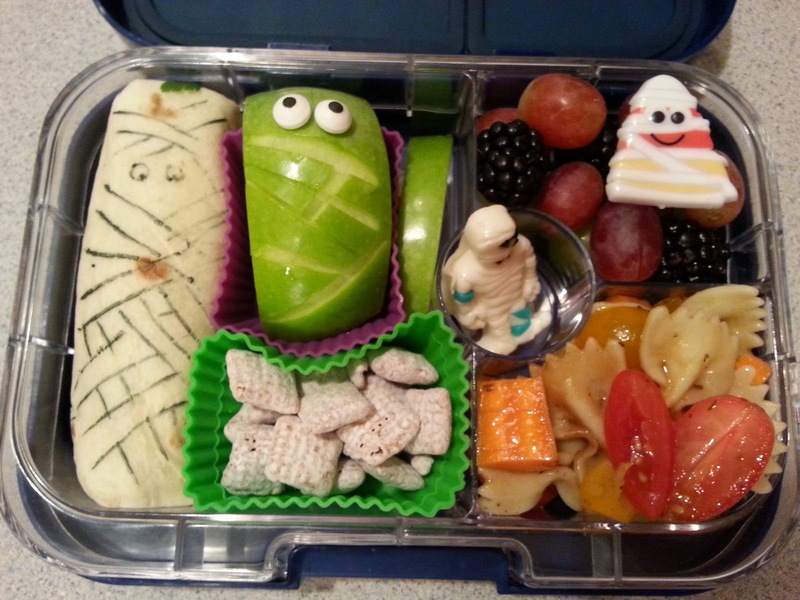 I’ll end with a mummy themed lunch I packed for my husband. He had a turkey wrap decorated with food safe marker to look like a mummy. I also cut a green apple, treated it with Fruit Fresh, and topped it with icing eyes to be similar to a mummy. In the fruit section, there were purple grapes and blackberries topped with a mummy candy corn ring. The lower section held pasta salad. The treat section had a gummy mummy and I included Muddy Buddies because I thought they fit the theme and could pass as little mummies. 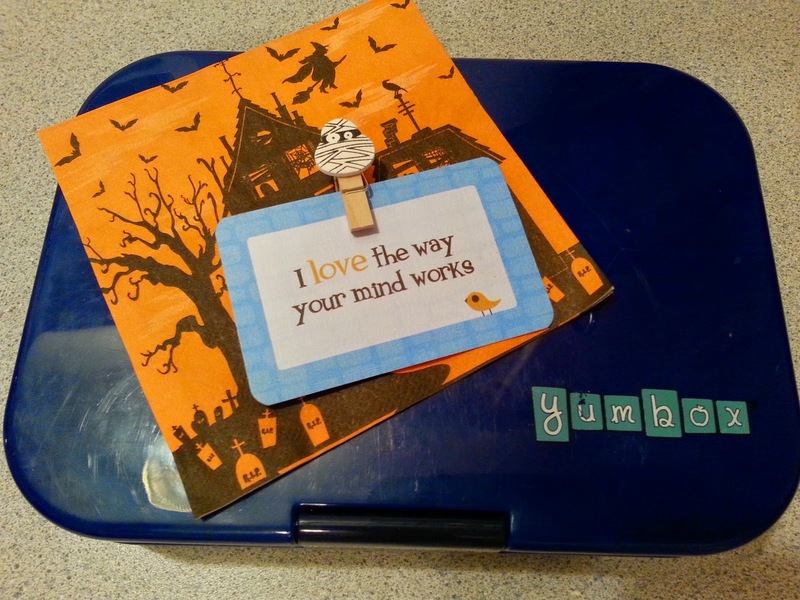 I found a little clothespin with a mummy on top and used it to hold a Lunchbox Love note as a special surprise in the middle of the day. 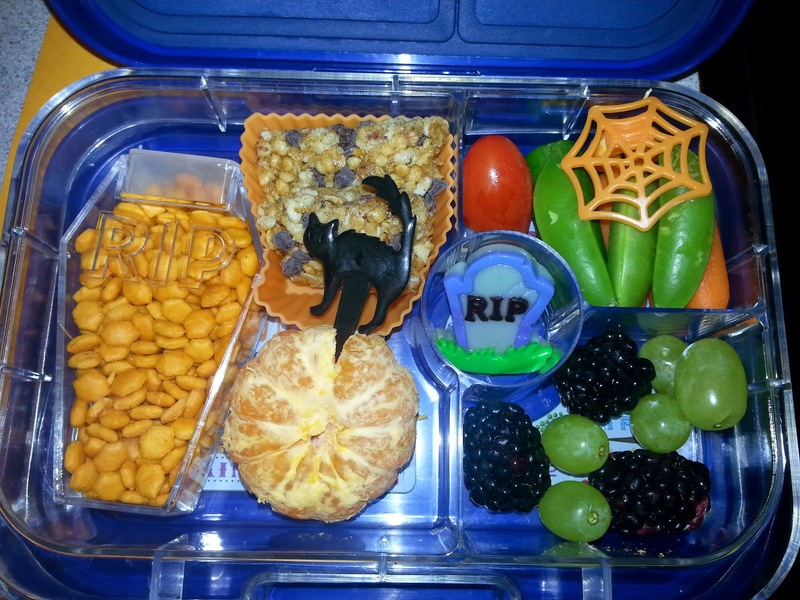 Thanks for looking through my Halloween Themed lunches. Please make sure to click the link below so you can visit the next stop on the hop at Bentos on the Bayou. 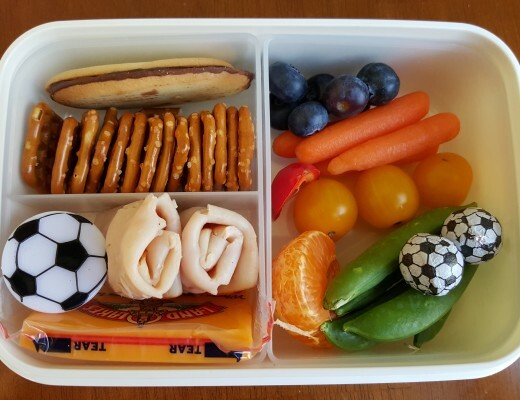 Awesome lunches! Love the adorable candy corn picks too! I love your apple mummy!! So fun! Love all the picks and little coffins too. 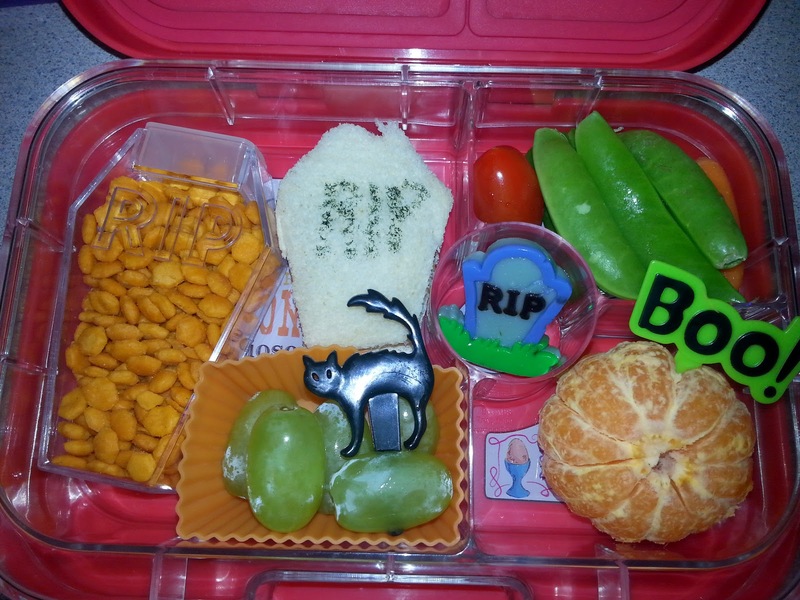 I am seriously dying over the candy corn rings and those coffin containers. So rad. Loved all the "eye candy". soooo many gorgeous fun lunches!! love 'em all!! Love the rings and picks you chose.